We ran away to Colmar, France in October. 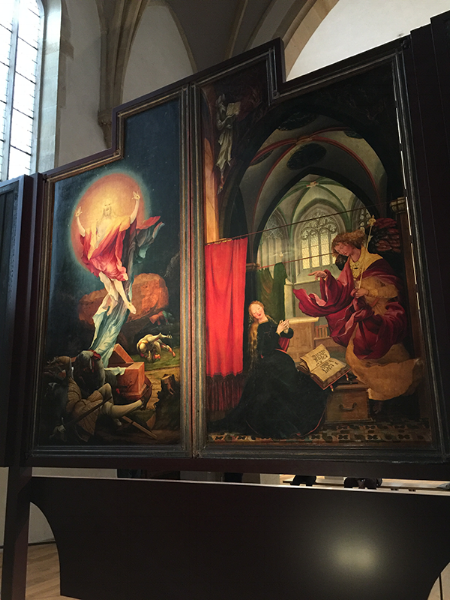 Besides sorely needing a change of scenery (work stress, life stress, universe stress) , our main goal was to see the Isenheim Altarpiece at Musée Unterlinden. The piece is breathtaking. Sculpted and painted by Niclaus of Hagenau and Matthias Grünewald, the altar piece was constructed in the early 1500s for a hospital in the area. The polyptych shows - among other things - the Crucifixion and Resurrection. “The first thing you see, walking through the chilly gothic chapel towards Matthias Grünewald's Isenheim altarpiece, painted between 1512 and 1516, is death.” - The Guardian, December 12, 2007. I was moved by Grünewald’s part. His renderings of death reveal a desire not to merely show or paint death, but to lead us *into* death. To be covered, enveloped, swallowed by it. To force us to examine - in all its macabre, frightening glory - Christ’s giving up the ghost. So he could rise to meet His power. Balcony view of the Crucifixion panel. What ghosts are you willing to give up? What patterns, thoughts, behaviors are you willing to let die to achieve your glory? What are you willing to kill? The last question is an important one, for there is no resurrection without death. The pain must come forth. I asked myself the question as I stood in front the altarpiece with my deck. And pulled a card. The Queen of Swords appeared. Our personal sagas serve as our origin stories. These stories are useful, but they also hold the danger of psychologically pulling us back into the actual stories, breathing life into them and taking over our souls. Queen of Swords pull in front of the Resurrection panel. How can we kill the story, but keep the message? How do we kill the story but honor the spirit? This is where the Queen of Swords comes in. She weighs the options, decides, then cuts. She kills, putting to death all sentimental connections and leaving only the useful ones. “She has used the sword of her intellect to free herself from confusion, doubt, and fear; now, although she frowns at the world, she opens her hand to it. Though clouds gather around her, her head remains above them in the clear air of truth”. - Rachel Pollack, Seventy-Eight Degrees of Wisdom (London: Element Publishers, 1997) page 213. Let’s take my origin story as an example: I grew up being told I was ugly, not by people who meant to be mean - not by a long shot. They told me I was ugly (bug eyes, nappy hair, a gap between my two front teeth, knock knees, pigeon toes, etc), to give me a heads up that - on top of everything else - including being a black woman - I had to be better than everyone else because I wasn’t pretty or even considered halfway appealing. I caught the brunt of this from my peers during my school years. My 10th-grade classmates called me "fly". No, not the hip term. They called me "fly" because - according to them - I resembled one. I was taunted with sounds of buzzing almost on a daily basis. Today those actions would be called bullying. But back in the early ‘80s it was called "school life". The teachers either ignored the taunts, or laughed along with everyone else. Of course, I grew up - and changed. But the story stayed, even during my television career and beyond. The hair straightening with burning chemicals, the layers of contouring makeup, the dental floss tied around my two front teeth to make them move together because the braces didn’t work. Yep. I went through it all. Wait. Aren’t you tired of me rambling on? I know I am. And that’s where the power of the Queen of Swords comes in. As Pollack says, the Queen “has used the sword of her intellect to free herself from confusion, doubt, and fear”. For me, that intellect was fed in part by works from authors such as bell hooks. Her Sisters of the Yam helped me not to accept - but at least to understand - where the harsh criticism of my looks came from, especially form my “own”. Exploring the way we as black women use this form of “telling it like it is” will help some of us, who may see ourselves as open and honest, examine whether we are really dedicated to truth-telling when we are exposing something about someone else. Harsh criticism, with a truth-telling component, is often a major characteristic of black mother-and-daughter relationships. Since many black women were and still are raised in households where most of the love and affection we receive comes from black women elders - mothers, aunts, and grandmothers - who may also use criticism in a verbally abusive way, we may come to see such a practice as a caring gesture. And even though it wounds, we may imagine this healing takes place for our own good. - bell hooks, Sisters of the Yam: black women and self recovery (Boston: South End Press, 1993) page 33. This long passage above showed me that what I experienced in my younger years was normal in its abnormality. I intellectually processed it, using it to explain what had happened. She handed me her sword and nodded. The story, my story, still in the bundle on the stick I carried with me through my life, moved a little. “Be quick,” the bundle whispered. "Set me free. I'm tired of traveling". The sword was heavy. It took two hands to raise it above my head with the tip pointing down. I thanked my bundle, my story. I thanked it for - for better or worse - linking me back to home and my family. I thanked it for keeping my humble during my career in my younger days. I thanked it for in a backhanded way, giving me something to fight against. And then I plunged the sword. The ghost floated up from the bundle - a spitting image of her - looked at me, and said, “Thank you. Thank you for releasing me". And then came my resurrection. The resurrection of that little girl, the one left behind when the “story” bundled itself up for the life trip. There was no room for her. The one who never had the chance to be silly or attractive. The Queen wrapped her hands around the sword’s hilt, loosened the tip from the earth and tugged. The earth released the tip. She wiped the bundle's remnants off the blade, nodded at me again, and then disappeared. What are you willing to resurrect? Would you like to borrow my sword?